I am big on milk shakes. Give me coffee, strawberry or even rose milk and I am a happy camper. The orange one was introduced when I was young by a very close family friend. The one from whom I had the pineapple upside down cake. A lot of her cooking and dishes have inspired me and this post is dedicated to her. This is quite an easy drink and a no brainer. However, I decided to write about it because if you are like me, you will be inspired to try something long forgotten and revive old memories or share it with friends and create a memory. 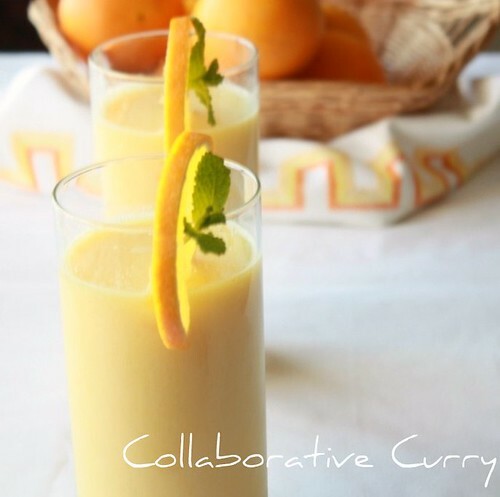 You will love the burst of orangy zest in the milk. It will get you all refreshed. A glass of the shake in the morning and a toast will do just fine and keep you in an active zing zangy mood all day. Whip all the ingredients together. The only thing to remember is when you do an orange milk shake always make sure milk and orange are all cold. If not, it will curdle. Garnish with fresh cream and a piece of orange or like you see in the pictures on however your imagination leads you. Enjoy! yummy...super delicious, healthy ..and nice clicks too! Wow..its so refreshing..one question..do you make this orange concentrate, or its store bought?? What a refreshing and tasty milkshakes. YUM! Such a fantastic shake, do you prepared orange concentrate?? Beautiful ... I love milkshakes ... your recipe look so yummmy ! wow what wonderful refreshing breakfast option. love every bit of it.pics are so colourful too. Milkshake looks so rich! !..yummy and attractive! Orange in milkshakes that sounds interesting! Great clicks....luv the neat presentation! 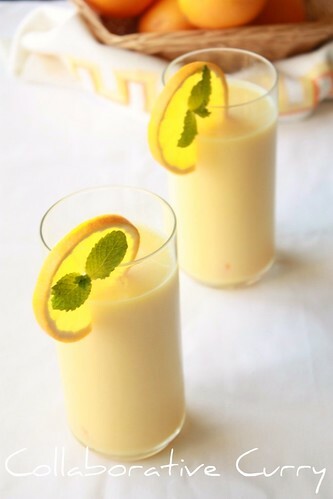 Beautiful..never thought of making milk shake with orange..thanks for the tip :-)love the presentation.. Oh! !its so refreshing..:) My daughter being a great fan of orange would love this for sure :)will try it.Thanks for sharing. Cool click, looks very refreshing, love the color. Y'know I drank this juice during my FL's trip for almost a week for breakfast..I loved it and I am glad you shared this recipe..
My son is a great fan of milkshake even in cold weather he loves it! This one is a gorgeous shake! i love these too..love your clicks.. Healthy n yummy milk shake. beautiful clicks dear! Nice recipe.. Hi friend this is vijay here.. ur doing a really good job.. can we exchange links..
Hi friend this is vennilla here.. ur doing a really good job.. can we exchange links.. I think you should have mentioned the name of your friend to whom this post id dedicated. that's a yummy refreshing drink for the breakfast!! !! Very well presented, it is so simple..I am going to make it in the morning. A 2 Z Veg: - I bought minute maid old fashioned orange concentrate. 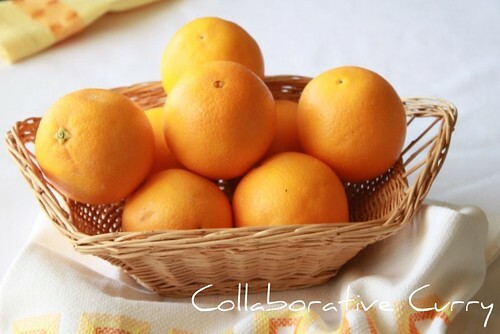 If you want to make from scratch take juice from fresh oranges. I prefer leaving peeled orange either in the refrigerator or freezer and before making your shake blen it and add cold milk to it. The key for this shake is to keep everything very cold or else like someone had mentioned it will curdle..
Abhilash - You are right... but not all people want their names published. However, I will check and have her name known if she agrees. Enjoyed reading all your comments and we request you keep them coming..
Yummy milkshake, looks delicious. Nice presentation. u r right!! this is really delicious.. i too make this often. first time i heard of orange milkshake is through my BIL who made it and it curdled. Now i will tell him to use cold milk and orange for a sucessful orange milk shake. Lovely pics.